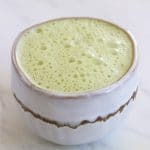 Thermomix matcha lattes are one of my favourite warming drinks. They are right up there with my Turmeric Golden Latte and Turmeric Hot Chocolate. They are super easy to make, especially in your Thermomix. But if you don’t have a Thermomix, you can just heat up your milk on the stove and then whisk in the matcha powder and your sweetener.